End Back Pain WITHOUT Drugs or Surgery!!! Spinal Decompression has come to Midtown Sacramento!!! If you have been suffering from low back pain for years and been told that a lifetime of taking drugs or a risky surgery are your only option, we have new hope for you. For more information and to set up a FREE consultation, call our office at 916-447-3344. The first treatment is FREE! You must experience this state of the art non-surgical decompression therapy for yourself! What is Lordex Spinal Decompression? The Lordex Lumbar Spine System Decompression Therapy uses a special kind of FDA-approved therapy called "closed reduction decompression" that alleviates pain by taking pressure off the nerves and discs in the lower back, or lumbar region, of the spine. Pressure on the nerves in the this region is a major cause of sciatica and other painful conditions. Lordex treatment does far more than provide temporary relief from pain. In many cases, the Lordex System can produce long-term pain relief because it actually corrects the problem of a herniated, bulging, or "slipped" disc. Lordex does this by creating a "negative pressure" in the disc, thus taking pressure off the sensitive nerves that surround the spine. Lordex Spinal Decompression works by applying a gentle force at the correct angles through the use of a specially-designed treatment machine. Lordex Spinal Decompression manipulates the vertebrae of the spine so that the bulging disc gets "sucked" back into its normal position. This allows increased nutrient flow into the disc. After repeated treatments, the disc can heal, and thus the pain problem goes away. Without drugs or surgery! Research shows that Lordex is successful in 86% of all qualified cases. Lordex is an especially attractive alternative to back surgery, which is risky, painful and expensive procedure from which some people never fully recover. Call today to schedule your FREE evaluation at 916-447-3344. We are conveniently located in midtown Sacramento! "Over the years I have had tremendous success managing low back pain patients with the Lordex Lumbar Spine System. Just because a patient does not qualify for spine surgery doesn't mean they don't need treatment. My treatment of choice has been the Lordex. Lordex decompression and strengthening program is compatible with virtually all mechanical spine pathology. " "As an Orthopedic Surgeon I was somewhat skeptical until I actually tried the Lordex procedure for my own herniated disc. I was nothing short of impressed with the outcome. I now routinely recommend the procedure for both acute and chronic low back pain patients. " The Lordex Spinal Decompression procedure combines a unique decompression of the Lumbar Spine at specific targeted segments, while simultaneously introducing strength restoration therapy to improve function and stabilize the spine. Patients experiencing severe debilitating pain can potentially avoid surgery with Lordex Spinal Decompression Treatment. Lordex Spinal Decompression may be the answer for problems that simply can't be resolved with medication or physical therapy. Lordex Spinal Decompression works and its satisfying to see patients respond who otherwise have little hope. -What is Lordex Spinal Decompression Therapy? Based on principles researched at major universities and in clinical settings, Lordex is a machine that relieves patients of their back pain by re-establishing functional capacity and decompressing the sensitive nerve fibers WITHOUT SURGERY. -Who is a candidate for Lordex treatment? Patients suffering from lower back pain, herniated discs, degenerative joint disease, sciatica, facet syndromes and other low back conditions. "Lord" for the Lordosis region of the spine. "Ex" for exercise. 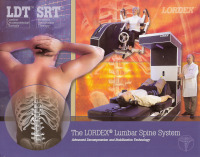 The system is comprised of the Lordex Spinal Decompression Unit and the RX1 Lordex Strength Restoration machine. 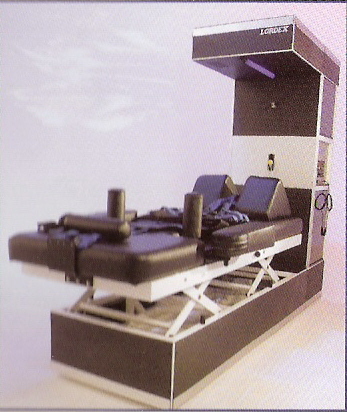 This is the only spinal decompression system that has a required exercise protocol. -How does Lordex Spinal Decompression work? Lordex Spinal Decompression targets the lumbar muscles to reintroduce kinetic activity. 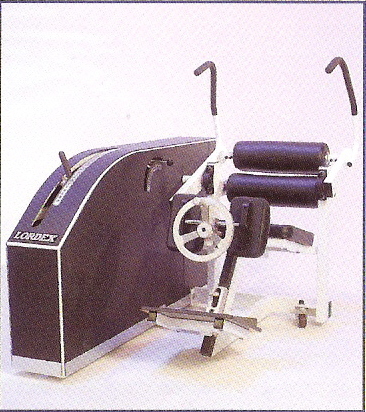 The Lordex Decompression Unit then comfortably tractions the spinal joint, decompressing the disk and reducing pain. Unlike conventional traction that stretches the back only, the Lordex Decompression procedure aids in reconstitution and disc healing, allowing increased circulation to the damaged area. -What do the procedures involve? The procedure is 20 cycles of decompression over the course of a 20 to 30 minute treatment. During each procedure, you will be fitted with a pelvic harness and a chest vest. While you are comfortably positioned on your back, a knee wedge will support your legs. The Lordex decompression table slowly and gently separates to relieve you of pressure that pinches the nerves. Following the 20 cycles of decompression, you will begin strength restoration therapy on the RX1 to re-stabilize your spine. Each RX1 procedure consists of 1. Pelvic restabilization. 2. Eccentric/concentric progressive resistance throughout your own range of motion in both flexion and extendion and 3. Release.